The Feisty Friday Night Fight! 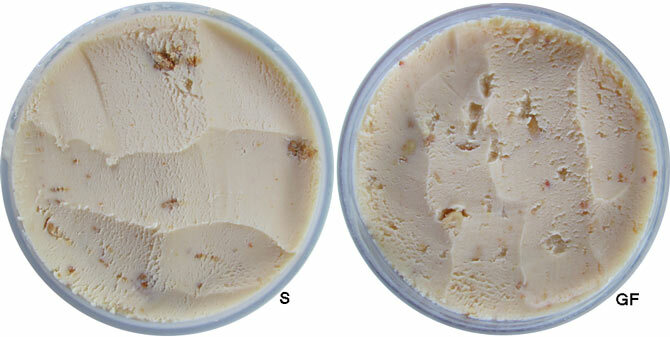 Gelato Fiasco's is a combination of peanut butter, peanuts, and sriracha. Steve's is basically the same thing plus pretzels. Now I've been debating which categories to break this one down into. Let's go with packaging, spice level, mix-in factor and overall flavor. 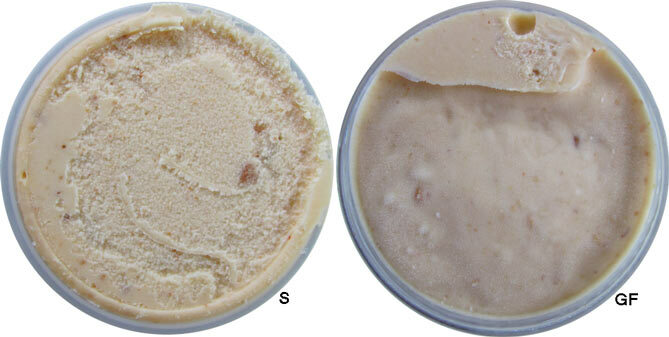 Both Steve's and The Gelato Fiasco utilize clear packaging. While Steve's has updated their labels, I still prefer the crest style symbol The Gelato Fiasco has going on. The color coded touch for each flavor is always a plus. That and I feel The Gelato Fiasco's containers are more sufficient for re-usability since they're a screw top instead of a traditional lid. This one easily goes to GF. Both of these smell spicy from the get go. Steve's is a more pronounced sriracha scent while you get more of a nutty smell with GF. ‎Steve's smell matches it's taste because this one brings the spice. It's a good burn from start to finish here. I'm a fan of spicy food so I'm enjoying this quite a lot. There's something about it that makes me keep coming back for more. GF's spice factor is a different beast. It gets you on the end and isn't quite as strong. It has the same quality as Steve's making me want to come back for more of that spice but it's much milder here than with Steve's. I'd say GF is about a 4 while Steve's is a 7 on a scale of spiciness. When spiciness comes to play, Steve's takes this round. GF uses only salted peanuts in their gelato while Steve's used both whole peanuts and pretzel pieces. Sometimes more isn't always better though. GF loads their pint with fresh, crunchy peanut pieces. There's not a single bite without a few chunks involved. Steve's mix-ins are more sparse with the pretzels being the majority of the two. They say they use whole peanuts but I could only find tiny pieces when I did run into them. The pretzels didn't really add much since they're quite tiny in size but thankfully they were fresh so their was no stale or sogginess to them. GF is back in the lead taking this round. While GF might have taken two rounds, this is the most important round of them all. A product can look good all it wants but if it doesn't taste good, it's not going to come out on top. ‎Steve's spiciness is definitely strong like I noted earlier. However, it doesn't drown out the peanut butter component. Instead it combines for almost a spicy Thai sauce flavor. Yes, I know Thai is in the name but I feel like I've had this flavor before from a Thai restaurant but I can't quite remember it's name. It's delicious and oddly works in a frozen dessert. However, the pretzels get lost in the mix outside of their textural change. They would've been better off amplifying the peanut flavor or maybe going completely outside the box and used some sort of Thai inspired mix-in instead to continue with the theme. If Coolhaus can put french fries in ice cream, I'm sure Steve's could figure out a way to put some crispy noodles into some. Oddly enough, there's also a spicy nacho cheese vibe going on here. It's shockingly good and something I found very appealing about Steve's. GF on the other hand is peanuts first and sriracha second. The base tastes strongly of peanut butter and reminds me of a spicy, chocolate-less version of their Peanut Butter Straccitella. The sriracha comes in on the end of each spoonful and leaves you wanting more and more. The salted peanuts add to the crave-ability of this one. As a whole, this flavor is pure genius and even Dubba who hates spiciness enjoyed this one a lot. There's also a nacho cheese vibe going on here but not on the same spicy level as Steve's. This round is tough to call. 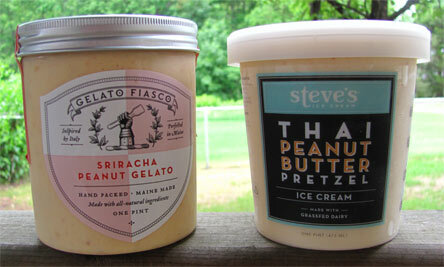 While I like the Thai inspired flavors of Steve's, The Gelato Fiasco's assault with peanuts just push them ahead of Steve's. Honestly, I'd recommend either of these two flavors to those who are adventurous enough to try them. If you're looking for something very spicy, go with Steve's. If you're still looking to get a burn with you ice cream but not sweat from it, go GF. That said, I wouldn't mind having either of these two flavors on hand when that sweet and spicy craving kicks in. 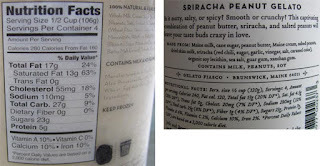 Maybe I'll make a sriracha peanut butter sauce for my sundaes one day... Thanks again to both Steve's and The Gelato Fiasco for the free samples. Now to you guys, what's your thoughts on spicy sweets? Are you for it or against it? What would you like to see happen from this trend? Let me know in the comments! 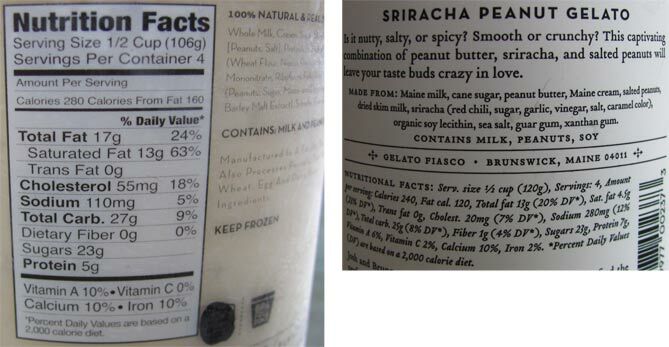 Dubba's Note: Nick wasn't joking, I really did like the sriracha peanut flavor despite the back end burn. It's just an amazing flavor. Don't be afraid to try a bite because it might just hook you in. Ooo, I will have to be on the lookout for these! I like the sound of the spiciness, even though I can't imagine what the nacho cheese vibe would be like.